For a printable document on our Microblend Division equipment, please click the download link below. Our In-Line Carbonator was designed to carbonate products being pumped into the bright tank. While the product is being transferred, this equipment carbonates to a specified volume of CO2 set at the touch panel. The ILC measures incoming GPM, temperature, pressure, and required CO2 volume. The unit calculates the amount of CO2 needed to be injected through a sparging tube into the product while controlling backpressure. Products include beer, flavored water, soft drinks, low velocity juices, and wine with < 1.5. D.O. The MicroBlend blending system is the only patented mass flow based multi-stream blending system that offers precision blending to an accuracy of ± .1% with a repeatability of ± .025%. The MicroBlend blending system has achieved its ability to measure, blend, carbonate and calculate product strength and yield information due to the capabilities of the Micro Motion Elite Mass Flow Meters and the specialized software developed for this process. Flow, density and temperature each play a crucial part in calculations performed in the MicroBlend™ system. The system uses Mass Flow Meters to measure the syrup, water and CO2 streams with blending ratios ranging from 2-to-1 to as high as 30-to-1. All quality, yield, efficiency and production records are displayed in real time as well as logged for review and can be ported to a supervisory computer. Informs operator when the syrup is at full strength at the blend unit on charge-ups. Variable blend rate lets operator choose the rate for desired containers per minute. Records line speed, filler efficiency and actual and projected cases. Can be totally hot or cold sanitized with no plumbing changes. Our customers claim that our MicroBlend blending system has less than a two (2) year payback. The MicroBlend blending system saves money on changeovers in two ways. First, when water is used to push syrup to the blend unit; the MicroBlend blending system decreases the amount of water proportional to the lowering syrup brix until the blending rate cannot be maintained and automatically shuts down. All blended product in the system is at standard and can be used with maximum syrup yields. 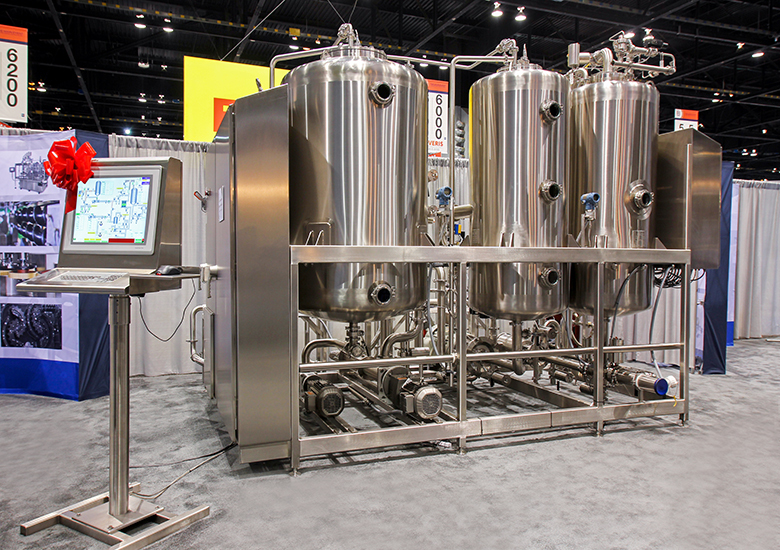 For production with 3 or more streams, Bevcorp’s Multi-stream Blbenders meet the current needs of the juice industry, as well as many other food and non-food manufacturers. Based on the recipe requirements, which can be stored in the blender’s memory, individual streams are enabled or disabled. The number of streams is essentially unlimited and each stream can be controlled to the flow meter’s specification of .1%. The units of measurement can be mass or volumetric. To achieve the various flow capacities, each stream has specific control valves designed for potential flow rates. Flow controllers have multiple deviation alarms programmed with warnings to shut down based on severity. Each stream has its own priming mode and settings for initial startup sequencing. Rinsing and CIP are also delivered to each stream or its reservoir. These blenders utilize specialized software to allow graphics, component totals, density, temperature and event and historical data logging. The historical data allows review of the production records and specialized reporting. Bevcorp’s CSD blenders are manufactured with either CO2 or N2O injection. CSD blenders can be equipped with either membrane or vacuum water deaeration. Bevcorp also provides product chillers with a reputation for quality. Hot fill and non-carbonated blenders are manufactured without the gas injection, deaeration, and product chilling. Juice blending systems are manufactured in 304L or 316L SS depending on customer specifications. Mineralized waters can be blended at approximately 25-to-1.